This antibody recognises MEK1, but does not cross react with other MAP kinase kinase family members. Synthetic peptide within Human MEK1 aa 1-100 (N terminal). The exact sequence is proprietary. WB: A431 cells and cell lysate. IHC-P: Human cervical carcinoma. ICC/IF: HeLa cells. Our Abpromise guarantee covers the use of ab32091 in the following tested applications. WB 1/1000 - 1/5000. Detects a band of approximately 45 kDa (predicted molecular weight: 43 kDa). 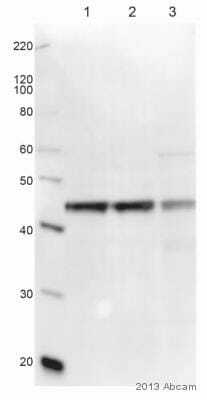 ab172730 - Rabbit monoclonal IgG, is suitable for use as an isotype control with this antibody. Catalyzes the concomitant phosphorylation of a threonine and a tyrosine residue in a Thr-Glu-Tyr sequence located in MAP kinases. Activates ERK1 and ERK2 MAP kinases. Widely expressed, with extremely low levels in brain. Defects in MAP2K1 are a cause of cardiofaciocutaneous syndrome (CFC syndrome) [MIM:115150]; also known as cardio-facio-cutaneous syndrome. CFC syndrome is characterized by a distinctive facial appearance, heart defects and mental retardation. Heart defects include pulmonic stenosis, atrial septal defects and hypertrophic cardiomyopathy. Some affected individuals present with ectodermal abnormalities such as sparse, friable hair, hyperkeratotic skin lesions and a generalized ichthyosis-like condition. Typical facial features are similar to Noonan syndrome. They include high forehead with bitemporal constriction, hypoplastic supraorbital ridges, downslanting palpebral fissures, a depressed nasal bridge, and posteriorly angulated ears with prominent helices. The inheritance of CFC syndrome is autosomal dominant. Belongs to the protein kinase superfamily. STE Ser/Thr protein kinase family. MAP kinase kinase subfamily. Phosphorylation on Ser/Thr by MAP kinase kinase kinases (RAF or MEKK1) regulates positively the kinase activity. Acetylation by Yersinia yopJ prevents phosphorylation and activation, thus blocking the MAPK signaling pathway. Lanes 1 - 4: Merged signal (red and green). Green - ab32091 observed at 43 kDa. Red - loading control, ab18058, observed at 130 kDa. 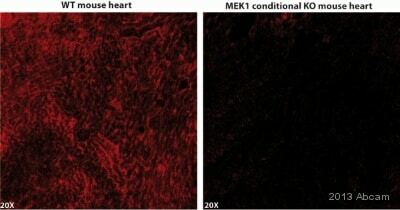 ab32091 was shown to specifically react with MEK1 in wild-type HAP1 cells as signal was lost in MEK1 knockout cells. Wild-type and MEK1 knockout samples were subjected to SDS-PAGE. Ab32091 and ab18058 (Mouse anti-Vinculin loading control) were incubated overnight at 4°C at 1/1000 dilution and 1/20000 dilution respectively. Blots were developed with Goat anti-Rabbit IgG H&L (IRDye® 800CW) preabsorbed ab216773 and Goat anti-Mouse IgG H&L (IRDye® 680RD) preabsorbed ab216776 secondary antibodies at 1/20000 dilution for 1 hour at room temperature before imaging. Immunocytochemistry/Immunofluorescence analysis of HeLa cells labelling MEK1 with purified ab32091 at dilution of 1/500. Cells were fixed with 4% Paraformaldehyde and permeabilized with 0.1% Triton X-100. ab150077, Alexa Fluor® 488-conjugated goat anti-rabbit IgG (1/1000) was used as the secondary antibody. Nuclei were counterstained with DAPI (blue). Secondary Only Control: PBS was used instead of the primary antibody as the negative control. Ab32091, at a 1/100 dilution, staining MEK1 in paraffin embedded human cervical carcinoma tissue by Immunohistochemistry. Overlay histogram showing HeLa cells stained with ab32091 (red line). The cells were fixed with 80% methanol (5 min) and then permeabilized with 0.1% PBS-Tween for 20 min. The cells were then incubated in 1x PBS / 10% normal goat serum / 0.3M glycine to block non-specific protein-protein interactions followed by the antibody (ab32091, 1/100 dilution) for 30 min at 22ºC. The secondary antibody used was DyLight® 488 goat anti-rabbit IgG (H+L) (ab96899) at 1/500 dilution for 30 min at 22ºC. Isotype control antibody (black line) was rabbit IgG (monoclonal) (1µg/1x106 cells) used under the same conditions. Acquisition of >5,000 events was performed. Publishing research using ab32091? Please let us know so that we can cite the reference in this datasheet.